In this release we've added a new simple, fast and highly-versatile alternative to Razor for developing Server generated Websites, official support for .NET Core 2.0, new ServiceStack.Azure NuGet package for deeper integration with ServiceStack Apps hosted on Azure and a number of new features and enhancements across ServiceStack. Firstly we’d like to announce this Release adds support for the newly released .NET Core 2.0. Our test suites have been upgraded to run .NET Core 2.0 as well as some of our existing .NET Core Apps. All new Web Apps created in this release were developed on .NET Core 2.0 which we believe is the first .NET Core release that should be given first consideration for development of new greenfield .NET Web Apps to see if it’s able to meet your requirements. 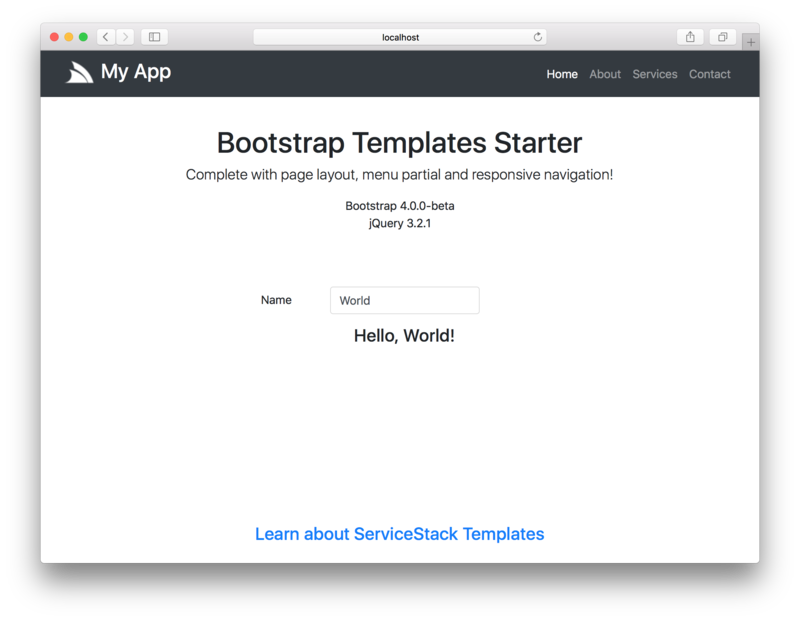 We're super excited to announce ServiceStack Templates. At its core ServiceStack Templates is a simple, fast and versatile general-purpose dynamic templating language for .NET and .NET Core. It requires no pre-compilation, is lazily loaded and Starts up instantly with fast runtime performance, is late-bound with no binary coupling, is highly extensible and is evaluated in a Sandbox with complete fine-grain control over what functionality is available to templates running in different contexts. We developed Templates because we want to be able to offer a simple, clean, highly-productive and innovative end-to-end solution for building ServiceStack Web Apps without the external baggage and issues Razor brings to a project. If interested in the finer details, we've published some of the limitations and issues we've hit in Why not Razor. Within this minimal syntax we've been able to achieve a highly versatile dynamic template language whose expressive power comes from its filters of which we've included a comprehensive suite to handle many of the tasks commonly required in Templates and Web Apps. Even in this initial release we're extremely pleased with its current form. It's not coupled to any external tooling or susceptible to any of the external factors that has plagued us with Razor. It's highly testable by design with unit tests being trivial to write that it's our most tested feature with over 350 new tests added to support its current feature-set, it's also our most documented feature. It's small, lightweight footprint and built-in Hot Reloading provides a fun, clean and productive alternative to MVC Razor that's easily integrated into any web framework and runs identically in every platform ServiceStack runs on, it can also be returned in ASP.NET MVC and ASP.NET MVC Core Controllers - in all cases, using the same high-performance implementation to asynchronously write to a forward-only OutputStream for max performance and maximum potential reuse of your code. Templates are designed to be incrementally adoptable where its initial form is ideal for non-programmers, that can gradually adopt more power and functionality when needed where they can leverage existing Services or MVC Controllers to enable an MVC programming model or have .html pages upgraded to use Code Pages where they can utilize the full unlimited power of the C# programming language to enable precise control over the rendering of pages and partials. Code pages take precedence and are interchangeable wherever normal .html pages are requested making them a non-invasive layered solution whenever advanced functionality is required. These qualities opens Templates up to a number of new use-cases tthat's better suited than Razor for maintaining content-heavy websites, live documents, Email Templates and can easily introspect the state of running .NET Apps where they provide valuable insight at a glance with support for Adhoc querying. All complexity with C#, .NET, namespaces, references, .dlls, strong naming, packages, MVC, Razor, build tools, IDE environments, etc has been eliminated leaving all Web Developers needing to do is run a cross-platform web/app.dll .NET Core 2.0 executable and configure a simple web.settings text file to specify which website folder to use, which ServiceStack features to enable, which db or redis providers to connect to, etc. The iterative development experience is also unparalleled for a .NET App, no compilation is required so you can just leave the web/app.dll running whilst you add the template .html files needed to build your App and thanks to the built-in Hot Reloading support, pages will refresh automatically as you save. You'll just need to do a full page refresh when modifying external .css/.js files to bypass the browser's cache and you'll need to restart web/app.dll to pick up any changes to your web.settings or .dlls to your /plugins folder. Web Apps also enable the development of Pure Cloud Apps where the same Web App can be developed and run entirely on AWS S3 and RDS or Azure Blob Storage and SQL Server by just changing the web.settings that's deployed with the pre-compiled Web App Binary. We've developed a number of Web Apps to illustrate the various features available and to showcase its strengths and the different kind of Web Apps that can easily be developed with it. The source code for each app is maintained in NetCoreWebApps and each Web App runs the same pre-compiled web/app.dll binary. All ServiceStack Apps now have access to rich introspection and queryability for inspecting remote ServiceStack instances with the new Metadata Debug Template. Which is the configuration that allows templates.servicestack.net/metadata/debug to be accessible to anyone. The development of Templates also brought with it the development of a number of high-performance utilities that are useful for use on their own. The ServiceStack.Text JSON Serializer was only designed for serializing Typed POCOs, you can still use it to deserialize dynamic JSON but you would need to specify the Type to deserialize into on the call-site otherwise the value would be returned as a string. ServiceStack's TemplatePagesFeature utilizes to replace the TemplateContext's built-in IOC to use Funq where it shares the same IOC instance and is able to resolve ServiceStack's AppHost dependencies. We're happy to report SimpleContainer is even smaller and faster than Funq and only requires a dependency to ServiceStack.Common.dll. It supports AutoWiring, constructor and public property injection but not Funq's other less used features like Child Containers, named dependencies and Request Scoped dependencies. The major change added in order for Templates to be isolated from the ServiceStack Web Framework was to decouple the Virtual File System providers from ServiceStack's AppHost and move them to ServiceStack.Common. This separation makes it easier to use VFS providers outside of ServiceStack AppHost which is a useful abstraction for copying files from different file sources as done in the copy-files project to upload files to AWS S3 or Azure Blob Storage. The VFS providers and extension methods in ServiceStack.Common use the same ServiceStack.IO namespace that the VFS Interfaces are defined in where typically this would be the only change required, including using ServiceStack.IO; if you're using any VFS extension methods. We intend to add support for additional providers in future and make it even easier for ServiceStack Apps to be able to move freely between hosting on an Azure or an AWS managed infrastructure. In preparation for .NET Core's plans to disallow sync read / writes to Request and Responses a number of internal handlers were refactored to use async APIs when writing to the Response Stream including static files and all raw byte, Stream responses, including HTTP Partial Content responses. Custom Results can implement the new IStreamWriterAsync and IPartialWriterAsync interfaces to return results that asynchronously writes to the Response Stream. ASP.NET, HttpListener and .NET Core hosts were refactored to use as much of the same code-paths as possible to ensure better consistency and code maintenance. The HTTP Request Pipeline was refactored to only use VFS APIs when determining static file requests resulting in more consistent behavior for all VFS sources. Requests to directories are automatically redirected to enforce a trailing slash, it can be disabled with Config.RedirectDirectoriesToTrailingSlashes=false. In future we'll use it to change the default mode of deserializing as much as possible without error, to fail fast when it detects an error condition. Initially it will be used in Text Serializers and OrmLite to detect mapping errors. Support was also added for Arrays of Nullable Types. You can send MQ Request bodies using a different registered Content-Type which ServiceStack will use to deserialize into the Request DTO. Stefan de Vogelaere from the ServiceStack Community released the ServiceStack.Authentication.LiteDB AuthProvider for LiteDB - A .NET NoSQL Document Store in a single data file. Several enhancements were added in ServiceStack.Text to improve support for Object Dictionaries and KeyValuePair's which are extensively used in Templates, including support in CSV, QueryStrings and AutoMapping/Conversion Utils. See JsonExpressionsTest.cs for more examples. By default PostgreSQL's dialect provider uses quoted snake_case for all Table and Column names. Where it will use the default Naming strategy and only quote tables and columns using reserved words. OrmLite's mapping is case-insensitive so will still be able to map columns as a result of PostgreSQL's lowercase names for unquoted symbols. The new [IgnoreOnInsert] and [IgnoreOnUpdate] attributes can be used to ignore properties from INSERT's and UPDATE's. The new SqlConcat, SqlCurrency, SqlBool and SqlLimit APIs can help creating cross-platform SQL, see SqlDialectTests.cs for examples.